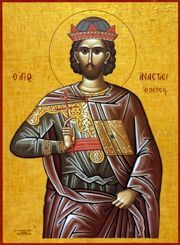 Saint Anastasius was a Persian by race, the son of a Magus, and a soldier in the Persian army in the days of Chosroes II, King of Persia, and Heraclius, Emperor of New Rome. The Saint's Persian name was Magundat. When Chosroes captured Jerusalem in the year 614 and took the Precious Cross away captive, Magundat heard the report of the miracles that came to pass through the Cross of our salvation. Being of a prudent mind, perplexed that an instrument of torture should be so highly honored by the Christians, yet seized with longing to learn their Faith, he diligently sought out instruction in the whole divine dispensation of Christ: His Incarnation, Passion, and Resurrection. When he learned what he sought to know, his soul was filled with wonder and joy. Withdrawing to the Holy City, he was baptized by Saint Modestus, Patriarch of Jerusalem, and became a monk, receiving the new name of Anastasius. As he read the lives of the Saints and the accounts of the holy Martyrs, his heart was kindled with love for them to such a degree that he prayed to be counted worthy of a martyr's end like unto theirs. Finally, unable to contain his longing, he left his monastery. Encountering certain Persian Magi at Caesarea, he rebuked them for their delusion. Since Palestine was still held in the captivity of the Persians, he was taken before the Persian ruler, questioned, beaten, and imprisoned. He was then taken with other captives to Persia, where, after many tortures, refusing to espouse again the error of his fathers, he was hanged up by one hand, strangled with a noose, and beheaded. The translation of his holy relics is celebrated on the 24th of this month. With hymns let us, the faithful, sing Timothy's praises as Paul's divine disciple and faithful companion; with him let us also laud Anastasius the godly-wise, who shone forth with splendor like a star out of Persia and doth drive away from us our bodily sickness and spiritual maladies. Share the feast of The Righteous Martyr Anastasius of Persia with an icon greeting ecard.